As a trained FOCCUS Facilitator you will have access to a proven and effective marriage preparation inventory with a user-friendly couple report. The FOCCUS Pre-Marriage Inventory Couple Report helps a facilitator target each couple’s discussion to topics important to marital success. The report is used to help couples celebrate their relationship strengths and talk to each other about topics warranting further attention. All of your couple inventories are available from any computer with internet access. You also have access to purchase materials only available to trained FOCCUS Facilitators: FOCCUS Facilitator Manuals, FOCCUS Inventory Booklets, FOCCUS Answer Sheets. A FOCCUS Facilitator completes training 4th edition. This training can either be done in-person or online. 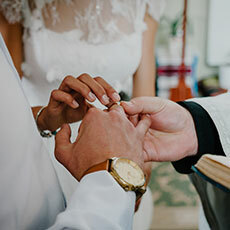 The training along with accompanying resources prepare facilitators to work with couples to help them have the necessary conversations prior to entering into marriage. Register for the in-person training – each location and trainer has their own way for registering for training so be sure to follow the instructions they provide. Complete the required training where you receive your FOCCUS training certificate and facilitator manual. After training, create a FOCCUS online account and request association with the organization for which you will be facilitating FOCCUS. The organization you request to associate with then approves your association request. Create an online account on the FOCCUS, Inc. USA website and request association with the organization for which you will be facilitating FOCCUS. Once your association is approved, you can login and order FOCCUS Facilitator online training which comes with a FOCCUS Facilitator Manual. Once you receive your FOCCUS Facilitator Manual you can complete the online training. You must watch the entire training and answer the 30 questions at the end of the training in order for the Facilitator Training Certification to be added to your account. After training, add your FOCCUS Facilitator Manual number to your account. Note: you must be a licensed professional or associated with an approved FOCCUS organization in order to function as a FOCCUS Facilitator. Additional Training – FOCCUS Facilitator Training also includes information about the REFOCCUS Marriage Enrichment Inventory, a set of seven marriage enrichment questionnaires developed for couples who have been married for more than two years. Email Confidentiality Notice: We do not share our email database with any marketers or third parties.